Preciosa Ornela presents a set of three original, seed bead bracelets in fashion colors for the 2012 - 13 autumn/winter season within the framework of a series of tutorials designed for people who are interested in creative work with seed beads from the Preciosa Traditional Czech Beads brand. 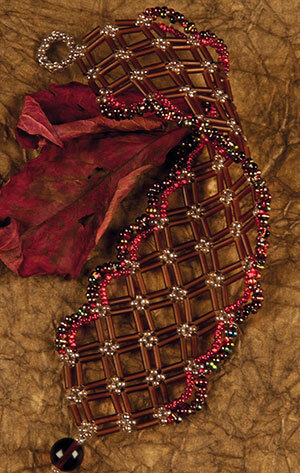 The flat bracelets are sewn from various types of seed beads in color combinations corresponding to the moods of the individual autumn months. The short description of the procedure together with the line describing the direction and priority of the stringing will assist you in creating these three completely different seed bead ornaments. The wide range of color finishes will enable you to apply your imagination and to create your own color combinations. 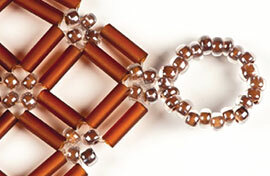 We wish you many creative ideas when working with seed beads from the Preciosa Traditional Czech Beads brand. Preciosa Ornela presents the second bracelet of them here. You can use the indicated color combination according to the detailed drawing or you can choose the colors according to your own design. The bracelet which we have described corresponds to the standard bracelet length of 17 cm without the fastening. 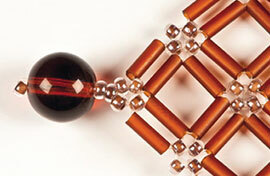 You can lengthen or shorten the bracelet as required. Begin the stringing with the outer loop (21xR10). 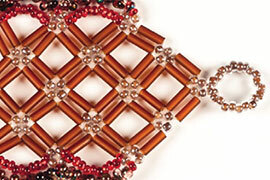 String the seed beads once again and tighten. String 4xR10, 1xB3 and then repeat this procedure 4x. Add the outer B3 and always pass the line through two R10 from the initial row. In this way, you will gradually make one square next to the other according to the drawing. In the case of the outer curves, first sew the outer and then the inner rows. Gradually string 10xF, 1xR11, string the outer 4xR10 and continue with the next curve. Always string 10xR11 for the internal curves and pass the line through the outer R10 again. Pass the line through the outer ball as the outer ring twice, tighten well, secure with a double knot which you should then pull into the holes of the nearest seed beads and cut.